Besides working on my own projects I also try to squeeze in contributions to other people's films. Here's such an example. 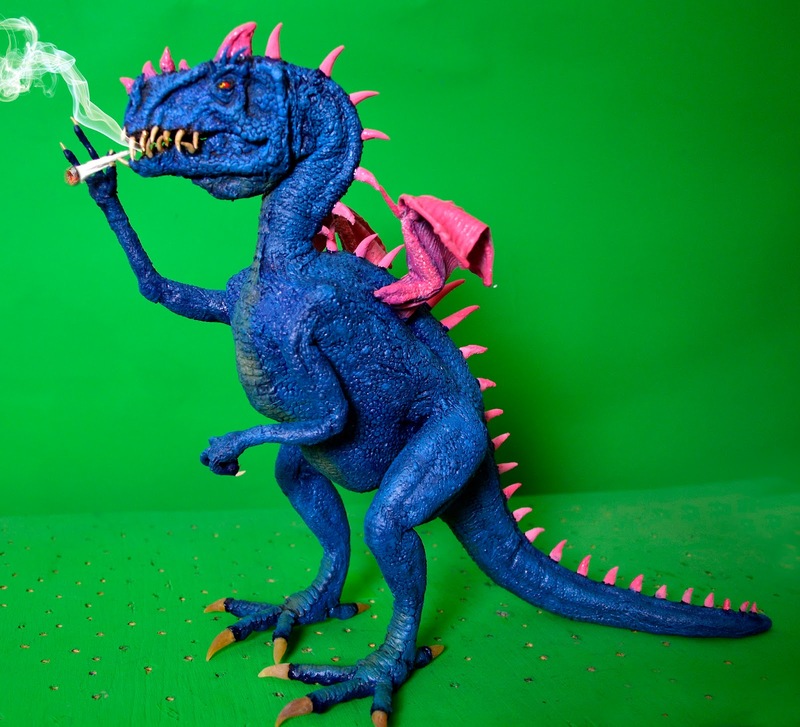 I was approached on Facebook by an independent filmmaker about buying old stop-motion footage from me for one of his projects. 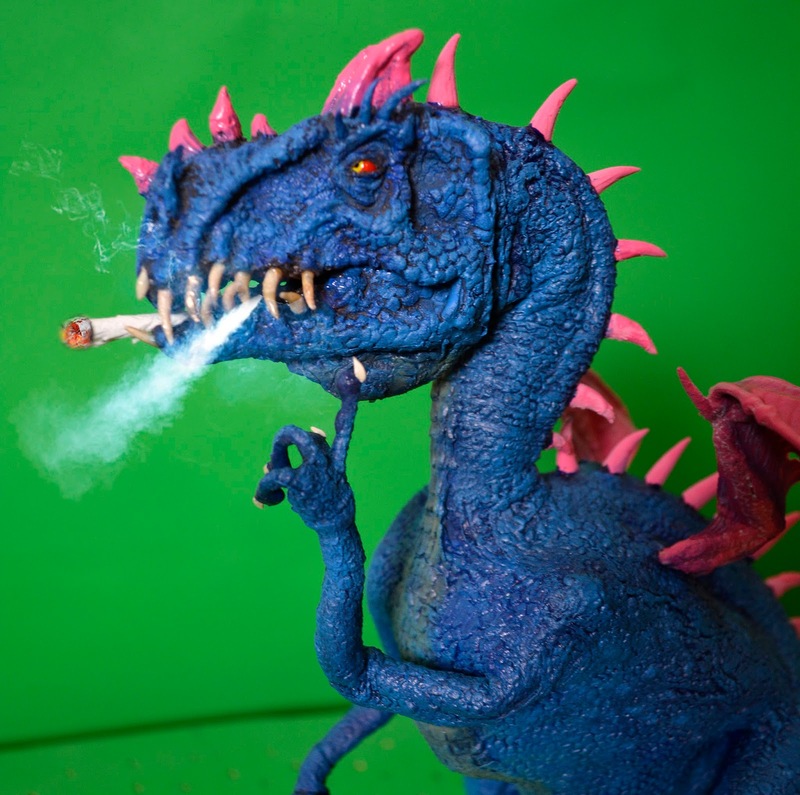 I instead suggested that I build and animate a brand new puppet, one of the characters from his film for that same sum, and he went with that. I should probably keep the lid on this project a bit, since it's currently in production, but I can say it's a fantasy stoner comedy (that's a combination surely made in heaven), and the character I've built and will be animating is a pot-smoking dragon. It's as basic as my puppets go, but I'll walk you through the steps anyway. As I usually do I started with the head to get the feel for the character. I had a bit of artwork for a proposed poster to base it on. The dragon is basically inspired by meat-eating dinosaurs with small Elliot the Dragon-like wings (the animated Disney original). 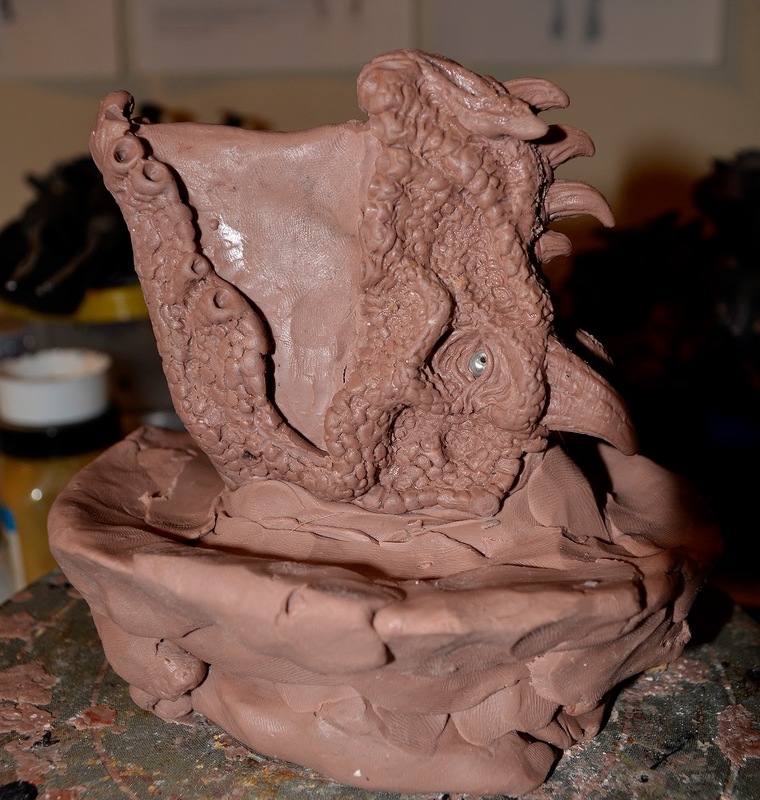 I sculpted the head in medium grade Monster Clay, leaving the mouth open to add more space around the gums. What I tried to do was create a character who could look fierce, but still had certain traits that, well -made him look a bit stoned. When I was happy with the look of the head I cast it as a hollow latex skin in a dental plaster mold. This head skin is supported with cotton dipped in latex to give it stability. 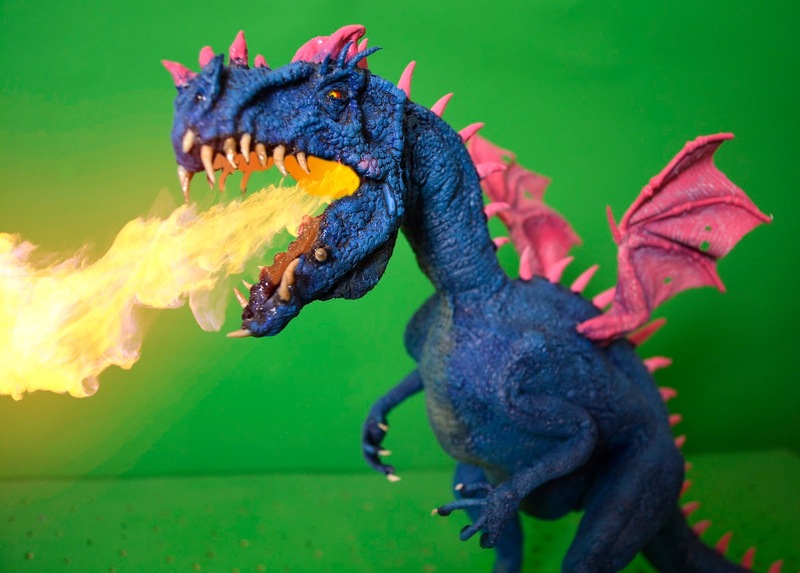 The corners of the mouth were filled with strips of soft polyurethane foam. The eyes are two plastic beads with holes through them, painted and partially covered with lacquer. They sit in hard silicone sockets stuck to the insides of the head using Polymorph thermo plastic, which covers most of the head interior to create a skull of sorts. I can insert a needle in the pupils of the eyes and animate them rotating. The teeth are made out of cotton and latex. Aluminum wires and Polymorph plastic make up the armature, here temporarily missing its tail, since it was mostly in the way when I pieced together the armature. The blue sections are covered with soft string and tinted latex. The legs have been given extra bulk by adding bits of dense seat cushion foam. 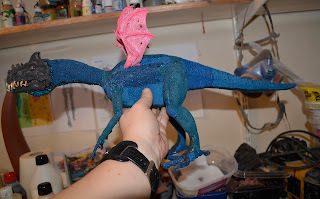 I've talked many times before about making latex wings for puppets, so I won't go into the process in any greater detail. 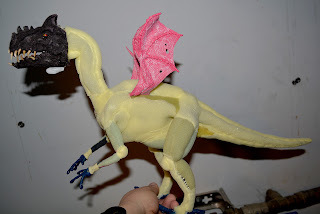 Basically I create a wing armature with aluminum wires, I cover it in soft string and latex, and then embed the whole thing halfway down into soft hobby plaster. 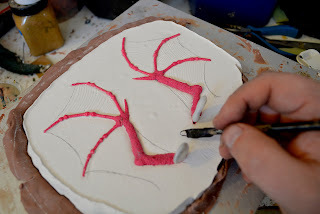 I can then etch details into the plaster that will become a part of the latex skin membranes that are painted in on top of both the wings and the plaster. 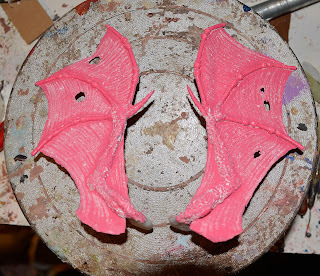 After two layers of latex has been applied the finished wings are peeled out of the plaster. 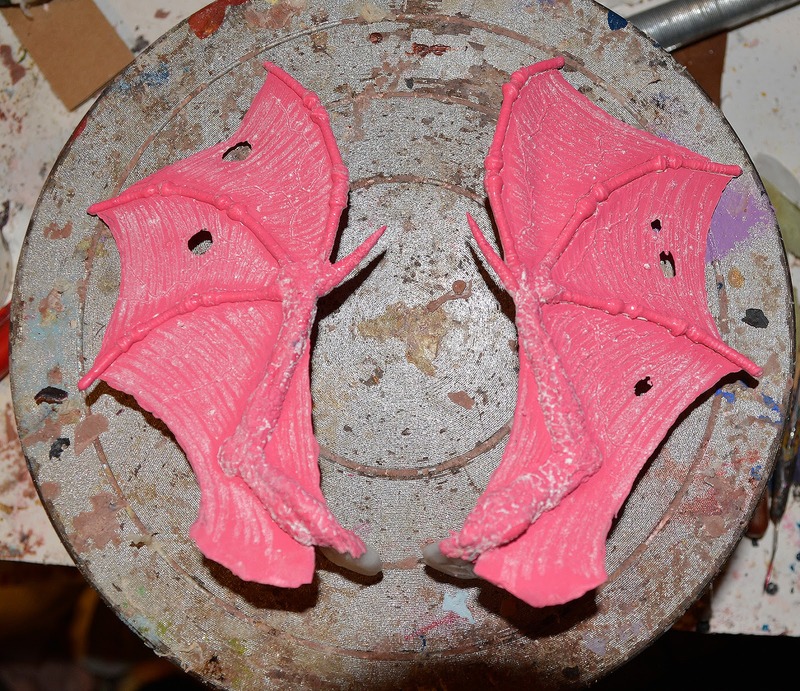 I deliberately left some holes in the wings to make them look a bit worn. These holes have no ill effect on the structure and durability of the wings. 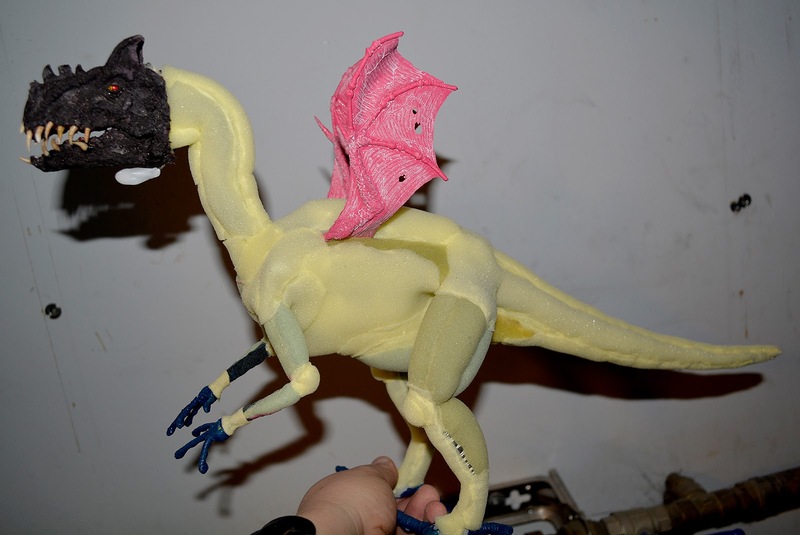 After the wings have been attached to the armature I can start padding the puppet using soft polyurethane foam. 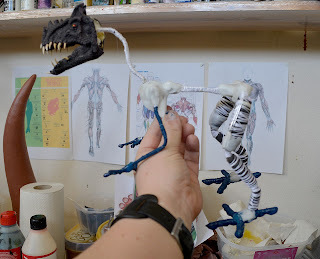 I added a bit of a gut to the character by putting a bunch of cotton balls in the centre of the puppet and covering them with a thin sheet of foam. This will make the midsection of the puppet soft, and allow the spine to bend properly. I've also added a small bit of aluminum wire and plastic under its chin, so I can animate a piece of the throat swallowing. After the padding is done I cover the puppet with bits of cast and tinted latex skin. 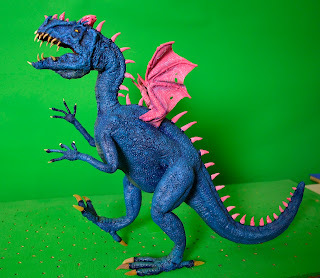 Seams are painted over and additional scales and warts added by placing tinted latex over certain areas with a pointed sculpting tool. 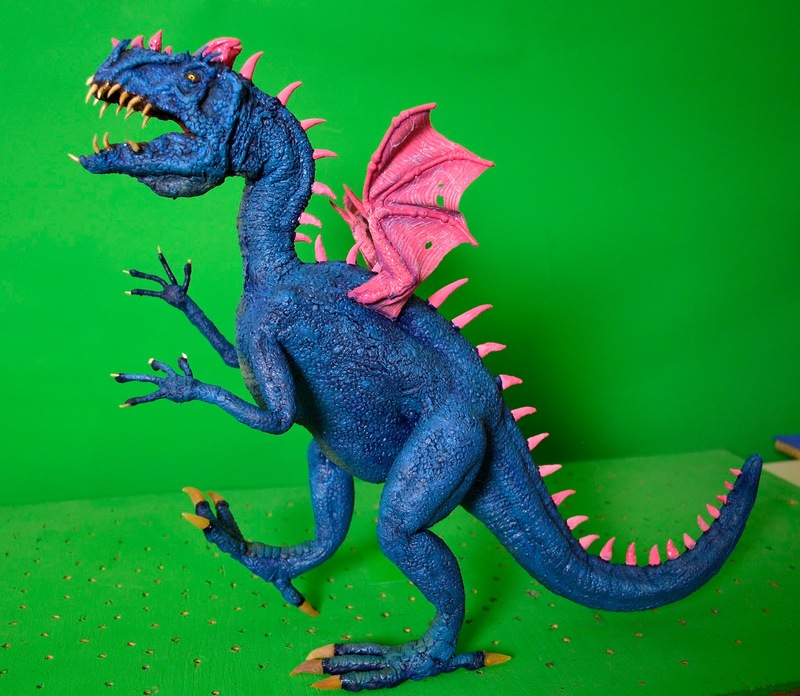 The dragon has been given a base color using latex tinted blue applied with a sponge. I've added horns cast in pink latex, as well as sections in the face made from smaller spiky bits created by rolling cotton dipped in latex. 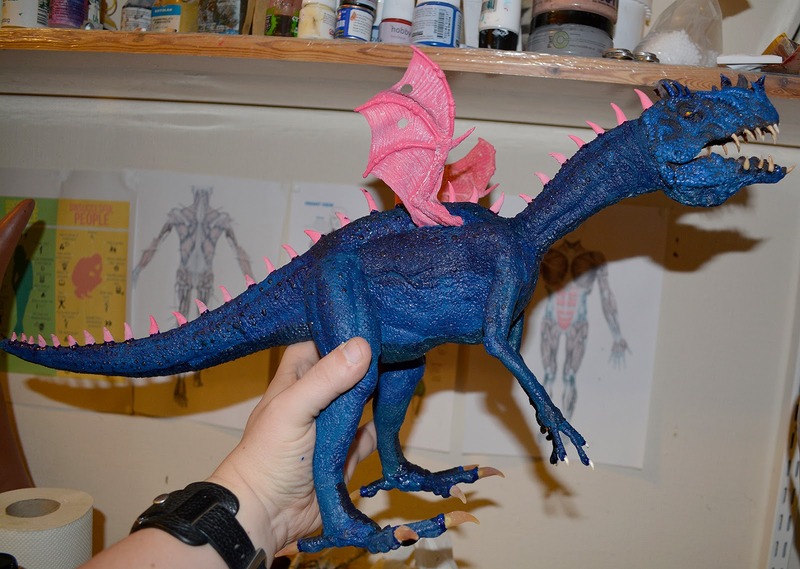 And here's the finished character, haven been given a finishing layer of drybrushed paint with PAX paint mix, as well as some augmentations using acrylic airbrush colors. The garish, slightly psychedelic look is again based on that poster concept. I'll get back to you eventually when I have more to report on this project.